Really good article written by a psychologist who is also an NBA Analyst with HoopsWorld. Dr. Travis Heath is a psychologist in private practice, assistant professor of psychology at MSU Denver and former team consultant in the NBA. He also co-hosts a show on Mile High Sports Radio weeknights from 6-8 p.m. You can follow him on Twitter@DrTravisHeath. 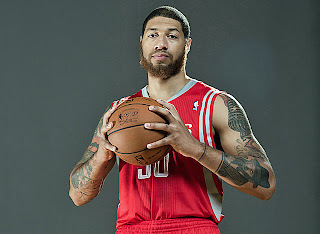 While I have never met Houston Rockets’ rookie Royce White, I have at least a basic idea of what he’s likely going through thanks to the countless journeys that patients of mine have allowed me to accompany them on. What makes White’s battle even more difficult is the fact that he is battling anxiety on a national stage. I see this kind of reaction from family members of people I work with all too frequently. This notion of “pick yourself up” or “get over it” is still extremely prevalent. This sort of notion is only intensified when the patient is a male, and even more so when he exists in the hypermasculinized world of professional sports. Now, I’m not going to try and even pretend to know White’s personal story. What I can say, at a very basic level, is that hearing through the media that he is “struggling with an anxiety disorder” is woefully insufficient information from which to generalize. Also, to assume that the only issue he is struggling with is “fear of flying” because that is what has been reported through the media is one heck of a dangerous leap. For some perspective (through the use of a crude analogy), it is sort of like if someone asked you what you drive and you responded by saying a vehicle. Are we then to assume that a Hummer is the same in its physical makeup, maintenance requirements and gas mileage as a Mini Cooper? Put differently, Generalized Anxiety Disorder is a much different presentation than a specific phobia, which is a much different presentation than Panic Disorder. All three of these (and many others) fall under the broad category of Anxiety Disorders in the Diagnostic and Statistical Manual of Mental Disorders, 4th Edition, Text Revision (DSM-IV-TR). Moreover, many people operate under the mistaken impression that there is one “correct” diagnosis for every person. If only people were so simple and my job so easy. It is not uncommon for people to present with comorbidity, or have more than one diagnosis simultaneously. Also, sometimes people struggle with very real anxiety that is negatively impacting their lives, but do not fit all the criteria for any single diagnosis. In short, the science of diagnosing “mental illness” exists in an imperfect and complicated system. Superbly written and supplies great insight into the situation. We don't have time to read/discuss in class this week, but please feel free to check it out. I promise it will help you understand a very complicated situation, like any situation that deals with mental illness and mental health. Link again to the full article: Really good article written by a psychologist who is also an NBA Analyst with HoopsWorld. Also interesting today was a quick word from Rockets GM Daryl Morey about the current situation with White.